Ultimate Fusion air dry paint. Colour: 11 basics plus 3 mediums!! Size: 3ml. for paints and 5ml for mediums. As an Introduction offer we throw in one of our latest kits, Lucia for only € 33,99 so you can test the new Ultimate Fusion Paints! The paint set will be a must-have for any artist wanting to get started with Ultimate Fusion - loves your art. It will come with a range of colours and mediums that can be mixed to produce beautiful lifelike babies. 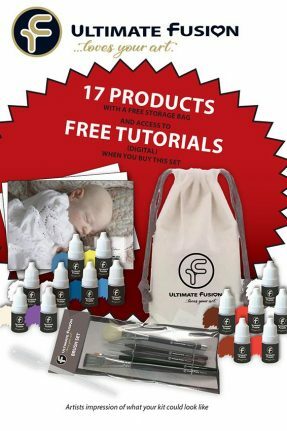 It also contains a 5-piece ultimate fusion branded brush set with specially designed brushes that will make painting with Ultimate Fusion easy and fuss free. 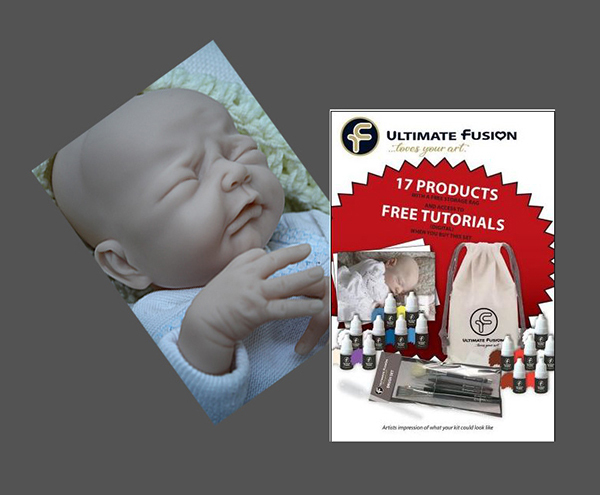 It also contains access to BONUS downloadable tutorials for newborn painting by award winning artists. A Genesis mixing chart to help artists convert using their favourite colours and free access to an Official facebook learning group which contains help and videos tutorials. This set also Includes a mini Blonde hair-painting tutorial to get beginners started. That’s access to tutorials and guidance from a range of artists with their own unique styles and techniques that can all be painted using the colours included in the "Lets get started" set. All inside a nice drawstring bag to store your stuff! These paints have VERY strong pigments so take just a little on your palette. It's better to take some extra later than to waste it! Instructions how to benefit most from the Ultimate Fusion paint and mediums can be found on the information page! The information sheet will be updated now and then and we aim to put more pictures overthere.